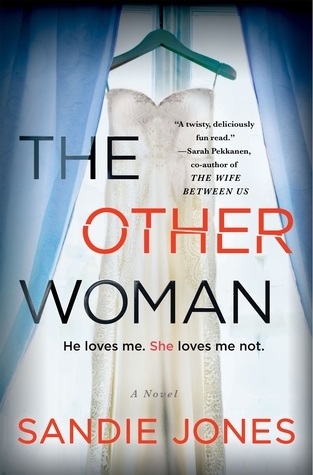 The Other Woman by Sandie Jones is another of those books that make me crave popcorn once I pick them up and start reading. It’s the type of story that early on you get the entire general idea of what will happen but still fun to sit back and wait for the fireworks and enjoy the show along the way. Emily has come out of a relationship where she caught her boyfriend cheating with a good friend of hers so she’s a bit hesitant to get back in the game until she meets Adam. The more Emily gets to know Adam the more she thinks he’s absolutely perfect for her, that is until he brings her home to meet his mother. On the surface Emily’s first meeting with Pammie goes well but for Emily the doubts begin to creep in after that meeting. While Pammie appears to be friendly and welcoming little things she does or say seem to get the best of Emily but Emily is not willing to give up her love for Adam despite his mother. The story inside of The Other Woman is not a new one but it’s one that has managed to grab my attention time and time again. The good old ‘evil mother in law to be’ trope did manage to entertain me until the very end again this time and oh what an ending it was. Emily and Pammie made such an entertaining pair this go round that I flew right through the book and would certainly recommend this to those that enjoy a good old fashioned drama filled suspenseful ride. I’m NOT going to go over to look on NetGalley to see if this is still available. I’m NOT! Hahaha… I am planning not to open NetGalley till I finish 10 books. Then I check😉😉 at least that’s the plan baby…. It’s fine. I will buy the book when it releases… 😘😘 No Grrrs. Everyone is bound by their rules. Probably but by then a new book pops up and I am like — my precious!! I always get a little sad but then tell myself to move on, there’s always more to click and if anything I can pick that one up later. You are in a different league than me, Carrie. At the pace you read and review, NetGalley should give all their books to you and you would still say – anymore? Hahaha you are that good. I’m trying hard not to go over to NG myself! I’m also still reading June books so I probably shouldn’t look, but your review is wonderful, and this does sound very good! That is wonderful, Carrie! I am hoping I can catch up soon! I have been a naughty clicker! Yeah, I’ve learned that from others telling me they found me there. Check mine and at least a couple times a month I find people that have commented before tossed in there along with others who are making perfectly fine comments. Of course there’s tons and tons of actual spam too so I’m not sure I’d want all that coming though either. Yeah, doesn’t make sense sometimes if you’ve stopped to check out a review or congratulate someone. I think there is a setting for that, does it not work? No or I wouldn’t have found yours in there tonight, you have commented before so there’s no way it should have tossed you. 😦 And I know it works the other way too on blogs I had commented on regularly and I end up in there. I read that if someone accidentally or I suppose on purpose marks you as spam you end up there for everyone…. but really I might believe that if it were a rare thing but it happens all the time. Yeah, that’s what I figure. I’ve seen bigger issues affect people so this one is just a nuisance really. This one sounds so good.I’m glad that you enjoyed it Carrie.I have the Arc so can’t wait to read it soon.Great review. I do enjoy this type of story and your review makes it sound so good, but I must restrain myself. I have not yet tired of the evil mother-in-law trope, perhaps because my MIL was pretty amazing.